Perhaps I love romance because I grew up with older brothers and romance was the yin to balance all the yang. I’ve always adored love stories with happy-ever-after endings. My comic sense was definitely honed at home where it was an important currency. Because I could make my brothers laugh with smart returns, silly puns, or double entendres, they accepted me in the boys pack, a big honor for the little sister! I hope that’s what you’ll experience reading my mini-novellas–life laced with humor and love-inspired joy. Stories where people laugh, cry, hurt, and still fall in love to warm our hearts. To read excerpts from the titles below, go to My Writing. During the day, Megan surrounds herself with water lilies and koi in the water ponds she designs. At night, memories of her lying ex-boyfriend remind her she can’t trust men. Then Jason meets Megan and sparks fly, chased by flashes of anger when Jason, battling a raging apartment fire, stands up Megan on their first date. Is St. Valentine powerful enough to bring these two strong-willed people together? I enjoyed this charming and sweet short novella. It made me laugh and it made me feel good. This is a great story for all of you who are looking for a quick and easy read. Totally sweet, totally cute, this small town romance set in sunny Southern California was such a treat to read! 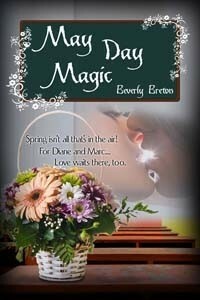 Beverly Breton does a masterful job of creating unforgettable characters with just a few strokes of the pen. I’M SURE you should add this book to your reading list because I’M SURE you’re going to be glad you did…I sure was! So this book was just wonderful. Eighty-seven-year-old Tillie watches everyone’s comings and goings from her porch in her Jersey shore town. When her dear departed best friend’s never-married daughter Susan retires from Manhattan and returns to her childhood home across the street, Auntie T’s primed to do more than watch the former Miss Independence. Kenny doubts his mother’s claim that Susan needs a handyman, but jumps at the chance to see the girl next door, the one he never forgot. Still, he’d be a fool to risk his heart after she left without a backward glance. Susan is adrift in the town she left decades ago, a place of memories, and possibly regrets, until she reconnects with Kenny–widower, father, and so much more man than the high school boy she remembered. Does she dare to reveal a secret she, her mother, and Tillie have kept all these years? Crazy Happy Hearts is a moving and charming story about a life-long love realized in middle age…Susan and Kenny have to bridge decades of absence to be together…You may tear up at the end, but they’ll be happy tears. School nurse and single mother Diane Avery is too busy caring for her children and everyone else’s to accept she is due for loving care herself. When her back seizes in front of hunky nursery owner Marc Stafford, Diane finds his offer to tend her ailment so amusing, she laughs away the suggestion…only to discover her back spasm has evaporated. But Marc is not to be dissuaded. And surprises keep coming for Diane and those close to her this May Day weekend as May baskets pop up on a number of door knobs. Before the sun sets, Diane will find the courage to uncover the most astonishing surprise of all. I really like this short read and felt the author did a wonderful job telling Diane and Marc’s story. I loved that the characters were older people and that the situations they found themselves in were extremely relatable and believable. 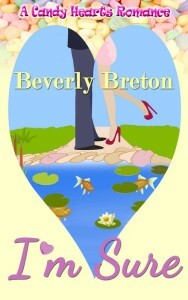 I loved Ms. Breton’s voice and found this to be one story that I’d highly recommend to other readers. The author’s written style is sweet, simple, and eloquently crafted. I absolutely adore how the author uses a simple but elegant custom to break the ice between the main characters and the happy every after ending makes this a book I would recommend to anyone looking for a short but sweet way to pass the time. Single mother Annika lives a safe existence centered around her five-year-old daughter, a little imp who is growing up faster than Annika wants to admit. Cameron is a widower working constant overtime to cover for a partner on leave, which leaves no time for his five-year-old daughter, let alone a social life. But then Cameron has no interest in the women focused on his long eyelashes, the fit of his jeans, and the size of his paycheck, and Annika has steered clear of the turmoil of relationships ever since her divorce. Are the two destined to remain single? 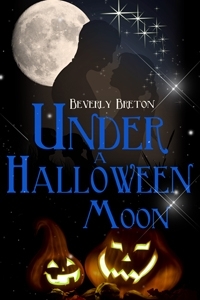 Perhaps, until the Halloween moon when Cameron crosses paths with the bewitching single mother of his daughter’s new best friend, and a weekend of mischief, masquerade, and magic convinces Annika to take a chance on love. This was a short sweet holiday story…a reassuring acknowledgement that magic can be found in the simplest things. Sometimes the past isn’t there to haunt you–it’s there to give you the chance you thought you never deserved…This is my first story by Ms. Breton, but it won’t be my last…If you want a sweet little romance that will have you begging for more, then you need to read Specs Appeal. Small town life can be a royal pain. Especially when everyone knows everything about everyone in town…If you wanna know what goes down between cute Liz and studly David, and you know you do, then you just need to read Specs Appeal…I promise you won’t be sorry if you grab this one. 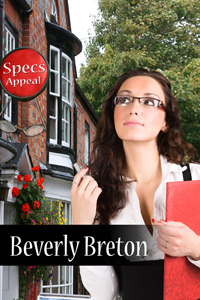 There is nothing like a sweet, funny romance to put a smile on your face; and Specs Appeal fits the bill. It is a warm and fuzzy kind of story with a large dose of humor…The characters are humorous, quirky, and down to earth…I enjoy Ms. Breton’s brand of humor and hope to read more by her in the very near future. If Dream Man never comes knocking, at least she’ll own the door. That’s 28-year-old paralegal Karen’s plan, anyhow, to buy a home, and the reason she’s been working every weekend…until she bends to her best friend’s pressure to spend Saturday at the wave pool. Determined not to be derailed by another dead-end relationship, she avoids looking at the cute curly-haired guy–his friends call him Spence–carousing in the waves. But the tide turns as she’s caught unaware, a wave pool virgin on her first time in, and swept into a head-on collision with one of his friends. When she manages to stand and open her eyes, the world has disappeared. She sees only Spence surrounded by dancing stars. Has she been knocked silly, or is he gazing right back at her? 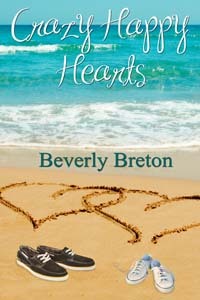 Hunks in trunks, warm sand, sunshine, wave pools and drama…Beverly Breton provides all this and more…In a few pages, Ms. Breton provides a well-rounded and charming tale full of main and secondary characters that are skillfully woven together in a series of events that changes Karen’s destiny…and does it with a wonderful touch of humor. 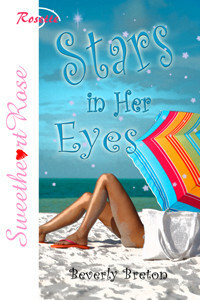 Stars In Her Eyes is the perfect thing for people on the go who need a little romance break. Stars In Her Eyes is a sweet story about beginnings and fate taking over when we need that extra push in the right direction.